For the sprite running this block, a speech bubble with the specified text will appear on the stage for the specified amount of seconds. When the green flag is clicked, the sprite will say "Hello!" for two seconds. 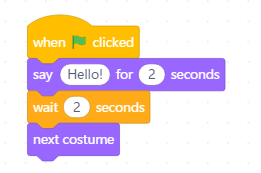 For the sprite running this block, a speech bubble with the specified text will appear on the stage, and stays until another speech or thought block is activated, or the stop sign under the stage is pressed. When the green flag is clicked, the sprite will say "Hello!". For the sprite running this block, a thought bubble with the specified text will appear on the stage for the specified amount of seconds. When the green flag is clicked, the sprite will think "Hmm..." for two seconds. For the sprite running this block, a thought bubble with the specified text will appear on the stage, and stays until another speech or thought block is activated, or the stop sign under the stage is pressed. When the green flag is clicked, the sprite will think "Hmm...". Changes the costume of the sprite to a specific one. when the right arrow key is pressed, the costume of the sprite will change to "costume1". Changes the costume of the sprite to the next one in the costume pane. If the current costume of the sprite is the last one, the block will loop to the first one. When the green flag is clicked, the sprite will say "Hello!" for two seconds. Another two seconds later, the costume of the sprite will change to next one. Changes the backdrop of the stage to a specific one. When the right arrow key is pressed, the backdrop of the stage will change to "backdrop1". Changes the backdrop of the stage to the next one in the list. If the current backdrop is the last one, the block will loop to the first one. When the right arrow key is pressed, the backdrop of the stage will change to next one. Changes the size of the sprite by the specified amount, measured in percentage. When the up arrow key is pressed, the size of the sprite will increase by 10%. Sets the size of the sprite to the specified amount. The default sprite size is 100%. When the green flag is clicked, the size of the sprite will be set to 60%. Changes the specified effect by the specified amount. Effects include: color, fisheye, whirl, pixelate, mosaic, brightness, and ghost. When the space key is pressed, the color effect of the sprite will change by 25%. Sets the specified effect to the specified amount. Effects include: color, fisheye, whirl, pixelate, mosaic, brightness, and ghost. When the green flag is clicked, the color effect of the sprite will be set to 90%. Clear all graphic effects on the sprite. When the space key is pressed, all the graphic effects on the sprite will be cleared. Shows the sprite on stage. When the green flag is clicked, the sprite will show on the stage. 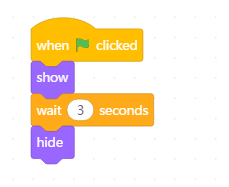 When the green flag is clicked, the sprite will show on the stage, and after three seconds, hide itself. Moves the sprite to the front or back layer. When the up arrow key is pressed, the sprite will move to the front layer. Moves the sprite forward or backward the specified amount of layers. When the up arrow key is pressed, the sprite will move forward one layer. The current costume number or name of the sprite. When the green flag is clicked, the sprite will say what costume it is wearing. The current backdrop number or name of the stage. When the green flag is clicked, the sprite say what the current backdrop of the stage is. The current size of the sprite. When the green flag is clicked, the sprite will say its current size.